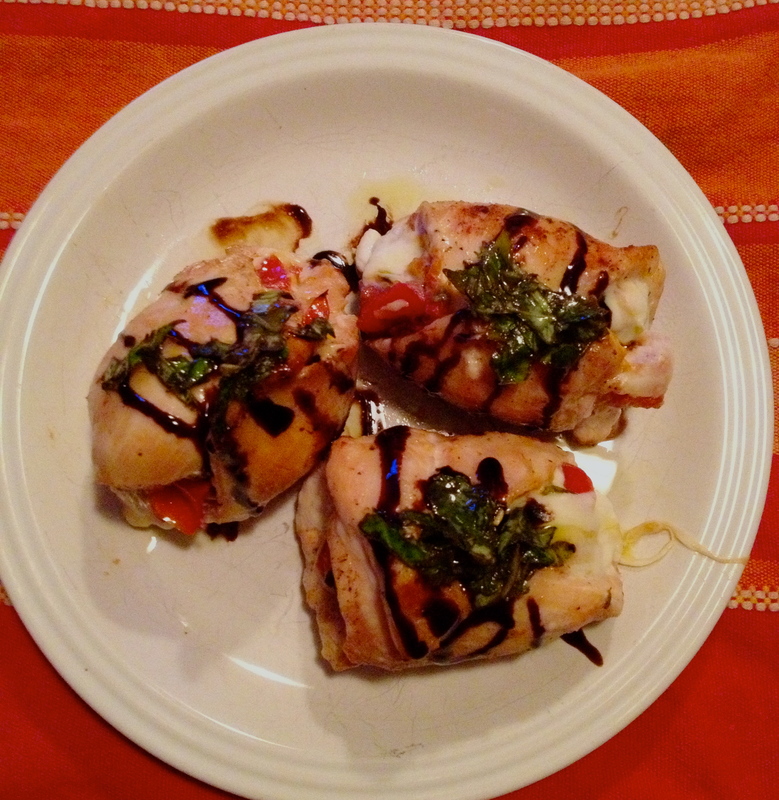 Caprese-stuffed Chicken with Basil Oil and Balsamic Glaze. After three days of work travel this week, I was exhausted when I got home Friday afternoon. I was so tired, in retrospect I feel like the only appropriate word to describe my state is the fantastic Irish expression “knackered.” I was knackered! I wanted to grab my yoga pants, put some 30 Rock on, and fall asleep. 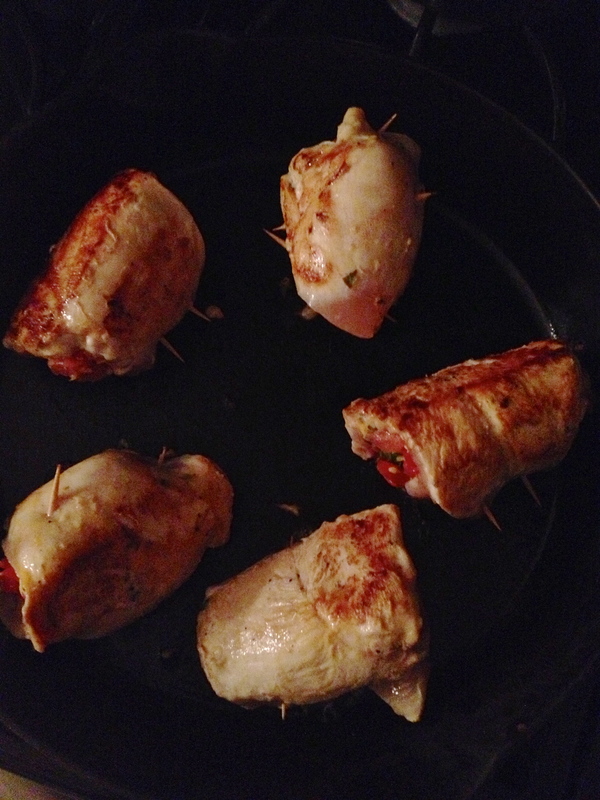 ….And then I thought of this recipe, and believe it or not, I got a second wind. 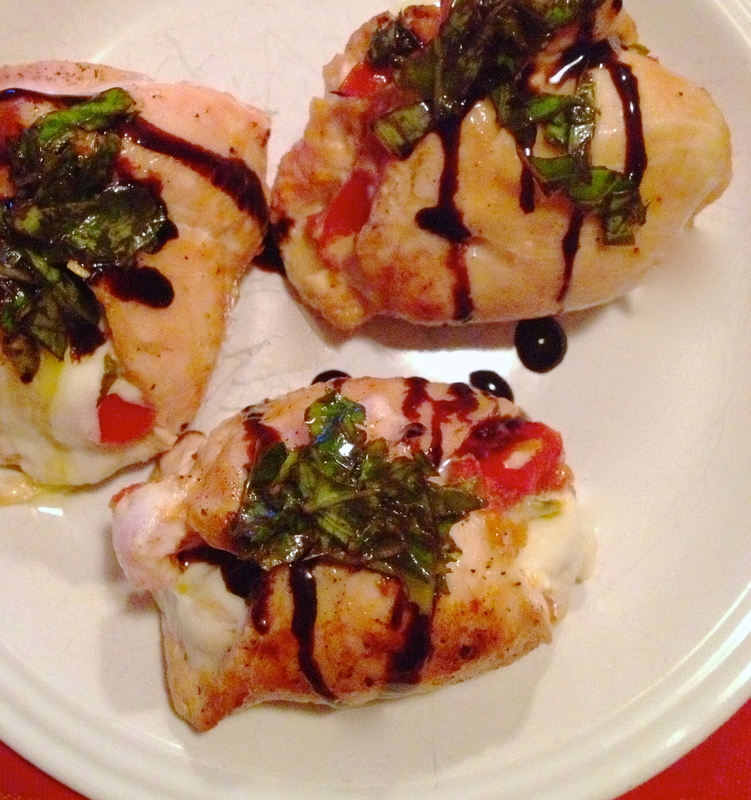 The punchy and comforting flavors of caprese go so well with baked chicken, and I was thrilled to get to use two favorite ingredients that I don’t have on hand every day: fresh basil and balsamic glaze. And the finished product was definitely deserving of such delicacies. Apologies for the photos here – when I started cooking, the light was lovely. But the night went on, as it tends to do, and by the time everything was ready to eat, it was too dark for a decent photo. I will most definitely make these again and again, so I’ll just have to snap a picture next time. Make these, and make them soon. First, put 1 tbsp basil in a ramekin or small bowl with 1 tsp olive oil, and stir. Set aside to marinate a little bit. 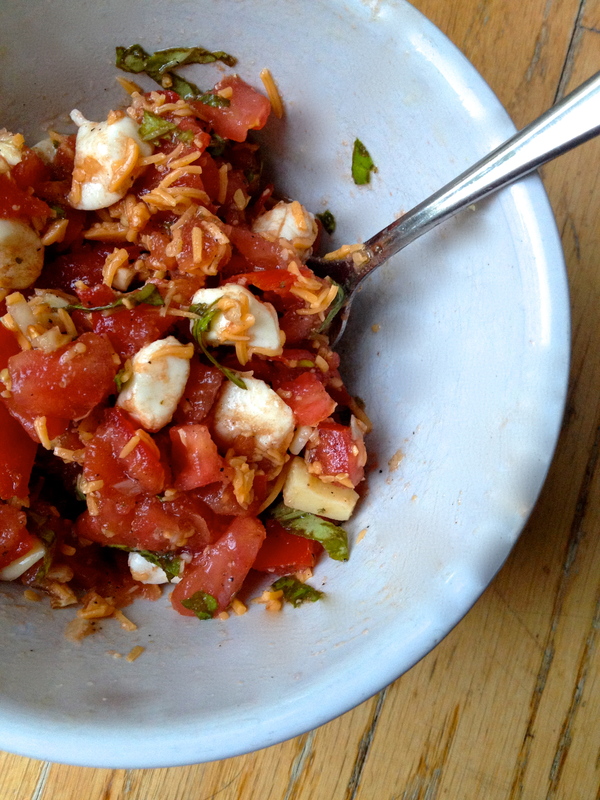 In another bowl, combine cheese, balsamic vinegar, 1/2 tsp extra virgin olive oil, 1 tbsp basil, garlic, and tomato. Season the chicken breasts with salt and pepper. 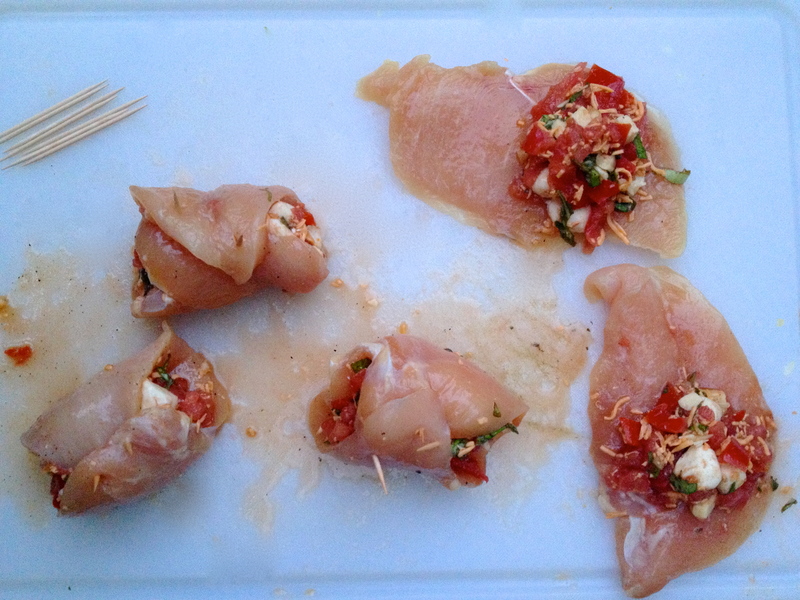 Top each one with a spoonful of the caprese stuffing and roll the sides over, to seal it in. Secure with two toothpicks. Repeat with the rest of the chicken breasts. 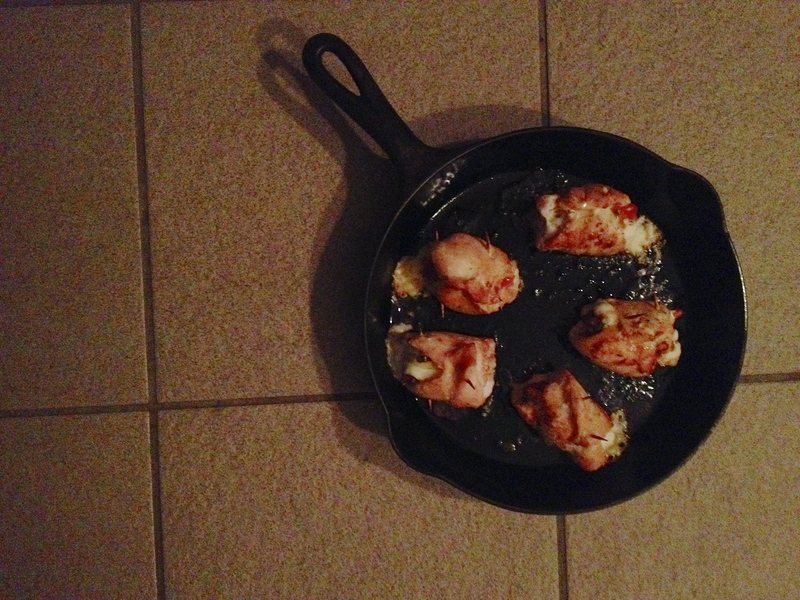 Heat an oven-safe, stovetop-safe pan, like a cast iron skillet, over medium heat with a bit of olive oil. Add the chicken and brown on all sides. Don’t worry about cooking the chicken, since it’s going in the oven – just give it some color. Then move the chicken to the oven and cook until the middle is no longer pink and the juice run clear. I didn’t time it, sorry. Maybe 15-20 minutes? I swear I’ll time it next time, folks! Just keep an eye on it. When the chicken is cooked through, plate it with a good drizzle of balsamic glaze and a scoop of the basil olive oil. Aww, yeah. Next Savory Braised Short Ribs.